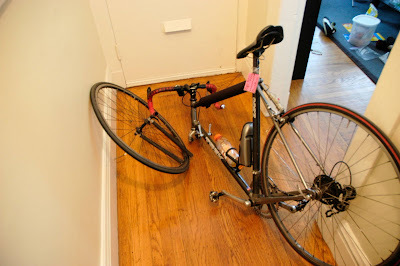 Here's a picture of my late 90s carbon trek after the front fork snapped off. I was biking up Market Street in San Francisco when it happened. No train tracks, no pot holes... just catastrophic failure :-) Luckily, I was going pretty slow, so there were only minor scratches and bumps as I hit the pavement. This was an aftermarket fork, which was on the bike when I bought it. I've been riding this bike hard through SF and Oakland for 3+ years, so I am not surprised it failed. Looks like an old design where the carbon was glued to an aluminum bracket. The carbon popped off at this junction. Even if a fork is old, I'd rather the legs didn't pop off. I've seen modern forks fail in the same way, so I'm not sure this is a solved problem. That frame looks like a Vitus Carbone 3, which I think only came with a aluminium forks. Intresting to see a bonded fork come unstuck, since I ride with one often. Trek called it the "death fork". Engineers actually quit their jobs when it was released. The stays weren't as wide as the aluminum lugs. They filled the gap with resin. They knew it would fail. That very fork resulted in 2 deaths over the years, hence.."death fork". wow! nice info about the "death fork". the frame is a trek 2300, which came with an aluminum fork. i've put the aluminum fork back on and it's riding strong. What kind of after-market CF fork was it that failed? I've had a Kinesis Carbon 2 fork on my bike for about 10 years now, but I'm getting worried about the bond between the Al crown and the CF fork blades.